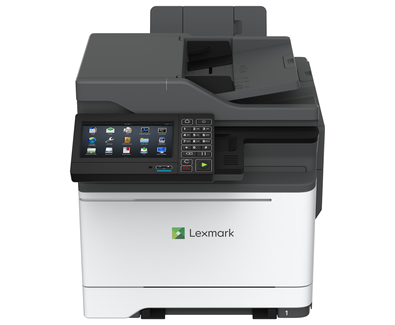 The Lexmark CX625adhe helps to boost your productivity with the clarity and convenience of a 7-inch [17.8 cm] e-Task screen, standard OCR and enhanced accessibility features. Driven by a 1.2GHz quad-core processor and equipped with a single-pass, two-sided scanner, the CX625adhe prints up to 37 pages per minute* and can scan up to 94 images per minute. The standard hard drive adds OCR and other scanning enhancements, while its steel frame, long-life imaging system, ease of upgrades and robust paper feeding system provide lasting performance in any environment. Designed to meet Section 508 accessibility guidelines, the multifunction Lexmark CX625adhe has features that optimize the productivity of every user, including those with varying levels of abilities. Its accessible, tilting 7-inch class [17.8-cm] e-Task touch screen, integrated voice guidance, and upgraded op panel give provide complete control.